VIDEO: BMW 5 Series - G30 vs F10, what's new? Home » Cars » VIDEO: BMW 5 Series – G30 vs F10, what’s new? VIDEO: BMW 5 Series – G30 vs F10, what’s new? Now that the all-new G30 BMW 5 Series has been revealed, the German carmaker wants to make sure that everyone knows exactly what has changed on the new car when compared to its sixth-generation predecessor, the F10. 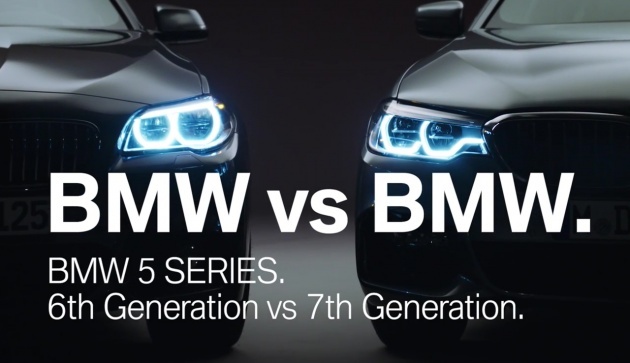 To do that, the company has released this informative video that takes you on a tour around both generations of the 5 Series, inside and out. Naturally, it starts with the exterior, where at the front, the trademark kidney grille has been redesigned so that it links to the new headlamps, which now feature a similar look to those seen on the latest 3 Series. Said grille also features an active shutter function for better aerodynamics, opening when extra cooling is required, and closing to reduce drag-inducing airflow. Moving on, the profile continues to feature the well-known Hofmeister kink, while certain lines have been accentuated to project a more athletic look for the sedan. As for the rear, the wider taillights not only feature new graphics, and wraparound the sides of the body as well. Below that, the 5 Series in 540i guise comes with dual trapezoidal-shaped exhaust pipes as well. For those curious how the new lighting elements look like while driving at night, skip over to the 1 minutes 45 seconds mark and you’ll find your answers there. Moving inside, the 5 Series’ living space has been thoroughly revamped to offer an even more premium feel than before with better materials and an updated layout. Among the key changes from the previous car is the free-standing display that is linked to BMW’s latest iDrive system with Gesture Control. In other areas, you’ll notice the brand-new steering multifunction steering wheel, 8.8-inch Dynamic Instrument Cluster, start/stop button, switchgear and ambient lighting. Passengers in the rear will also benefit from the new car’s slightly larger wheelbase, as well as the optional Rear-Seat Entertainment Professional system seen here. Of course, this video is just a quick run-through of what’s new on the G30, and there are certainly many other new features that are available not shown here. Show of hands, how many of you are interested in the brand-new 5 Series, which as you know, is the star in the latest instalment in BMW Film’s The Hire series? Malaysians better be careful when BMW Malaysia launch the 520i and 528i G30. This is because, when they launch the 530e, it will be at least RM100k cheaper than the 520i and 528i. There goes the RV of these 2 cars. Just like the X5 owners. They bought their X5 for RM588k. Then one fine day, BMW Malaysia introduced the X5 40e Hybrid Plug in for RM388k. Next day, those people who bought their X5 for RM588k saw their car become RM300k in value overnight. People with 1 year old X5 now crying so loud like baby. Same story to 320i and 328i owners. Wehn 330e was launched at far cheaper price, these 320i and 328i owners started crying like baby. Obviously u dunno the difference between eev and ckd hybrid incentives. Those wanna go for phev then wait la till next yr.
BMW have its signature… Angel Eye, The Kidney…It makes BMW special !! Not like Mercedes, changing all the time without tradition, the DRL from the bottom suddenly move to the top, out of no where from two arrows shape to one strike like the one in the Korean car and now 2 strikes for the new E… really like Rojak or Chap Fan !! I keep mistaken a Triton to a GLC. Bad design! Same here, always mistaken Kia Cerato as Mercedes. Need to get your eyes check! skoda superb has the kidneys or corona rings? Or you are just a benz fanboi venting your anger? Benz has their own more subtle signature as well, just that you don’t notice it because you apparently are a BMW fanboy and Benz hater which makes you not notice the subtle signature touches in Benz’s design. The Benz subtle signature? Maybe is ‘The Ah Pek look’? You apparently are Benz fanboy, I only tell the facts and you start labelling me fanboy and hater…what is that? not good…be a gentleman !! Uncle Prem, why did U label a Mercedes ‘The Ah Pek look’? Are U insinuating Ah Pek have NO class ?! The words that U use does Not bode well for someone who claimed to own a Porsche. It is OK 2 be a fanboy of a club but please do not stereo type someone or U will be called a Racist. Sorry have 2 use this space bcos downstairs have no more space. Bro, you miss out the iconic Tri-Star Badge. That is something Mercedes do not fiddle/change. At 12yrsold you have a lot of things to learn. A Badge is not a car design, we hardly I mean hardly see a car badge change, so it is not a big deal for a car company using the same badge all the while. Bro eh sori Uncle Prem, U are absolutely right, I certainly have alot to learn 4 a 12yrsold. As a boy, I already can recognize my father car with the Tri-Star badge is a German car. The badge may not be important 2 U but it is recognize as a symbol of success including the BMW/RR/Bentley badge. He told me his car can take him everywhere including hunting in the jungle. It has served him well for 20 years without much of a problem. I see many over 20 years old Mercedes running around & still in good condition but I see less BMW running around. An Angel Eyes, Kidney Grill may makes BMW special 2 U but it may NOT be special 2 all. Maybe U can share here what is a car 2 U other than the one U have mention. As a 12yrsold, you should not put your focus on luxury brands, instead you need to put lots of effort in studying and focus on your goal, like to be a doctor or engineer that can contribute to help improve the world and society. Too obsessed with luxury brands in young age will have very negative impact on a person. Girl may sell her body just for a LV bag, boy may end up in drug dealing or Ponzi scheme so they can buy a fancy cars. Think about luxury brands after you graduate and working for a few years, then that is your motivation to work hard and achieve goal in life. Badge is important, I did not say it is not important!! I just saying Mercedes design do not or insignificant in tradition and signature. I did not say Mercedes is not reliable and can not be driven after 20 years. I agree Mercedes is a good car and very lasting. You see more old Mercedes on the road is because Mercedes owner majority are older age people, old people will drive their car for longer time. Young people(BMW owner) change car very 3 to 5 years. Young people hardly drive car that more than 10 years old, so logically it is hard for you to see 20 year old BMW on the road. I do not own a BMW, I am driving a Porsche Cayenne, well only a recond one. Prior to this I was driving a Camry, I can afford a new Cayenne but thought of saving some money to buy lands, it will make me richer in the future. I like Porsche and BMW because their design has tradition and signatures, All the Porsche will have a shadow of a FROG, which is nice once you look at it you will immediately recognize it is a Porsche. Child 12yo, I am sorry for you. You were brought up in an environment full with illusion and you end up being delusional. This is the sign of a fail parenting in a family institution. A Beemer or anything equivalent or above its standard does not represent SUCCESS. They are those fractions that can AFFORD thus we call as RICH. SUCCESS on the other hand is broader than your house and your pea sized brain. You can WIN an president electoral (by money and influence) but it does not mean you are a SUCCESS leader. RICH is measured by your assets however SUCCESS is by your achievements and respect of others toward you! Well this is a sad comment actually. It is sad to see the testament of our education system has led to the creation of wealth and fame based generation. A badge is not a car design. Let me ask you, how many car company change their badge each time they change the car model? Non !! A badge is not a car design ??! Uncle Prem, U are so yesteryears man, A car is NOTHING without a Badge. Try asking BMW or any car selling it’s car without one & see what happen ! Young Ciku, say what ever you like. If it makes you happy for me to say that the badge is a car design then OK ‘A BADGE IS A CAR DESIGN!!!’. as least you are honest enough to reveal your true age. only a 12 year old child would not be intelligent enough to differentiate between what is a “badge” and what is “design”. F10 is a good design until G30 look the same. Interior wise E class much better. Exterior is very subjective, not much surprise from the current model. Ya.. really need a video to explain what is the difference because I can’t tell lol..
Well you peeps obviously have not laid your eyes on the new Mercedes-Benz E Class. You mean the bigger C Class? Or the Smaller S Class? They all look the same now. In short, they(C/E/S) all looks good when it’s park inside your car porch. Duh? The fact that you have to release a video to educate customers on the differences clearly points to the fact that there aren’t many differences to start off with! I would have a strong word with the marketing head….wrong strategy. Haha pity germans need to explain every changes they made to customers. Bcoz at a glance, nobody can see the difference! Stupid evolutionary. Still four wheels, still have to stuck in traffic jams, still need a human to drive, still cannot fly…so really nothing new. But young chicks will jump into G30 and not your old junk. Sorry you eat banana alone.